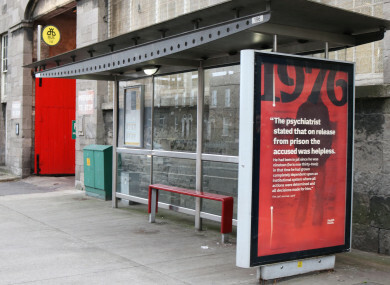 POSTERS AND ADS are being displayed in the area around Mountjoy Prison to raise awareness about the kinds of conditions prisoners in Ireland have been subjected to over the years. The project, Health Inside, is a new public art intervention about the Irish prison system and prisoners’ health in the nineteenth and twentieth centuries. Across eight bus shelters and two billboards, the artwork reflects on prison conditions, the mental health of men and women in prison and the social problems that imprisonment can cause. It’s a collaborative public art intervention by visual artist Sinéad McCann and UCD historians Catherine Cox and Oisín Wall. McCann told TheJournal.ie that it came about because she’s working on a research project in UCD in the Department of History that looks at healthcare in prison. As part of her work, she looks at how this research can be communicated to people through art and cultural events – taking it out of academia and making it accessible to all. Street scenes from Dublin north inner city (1974 & 1978). The photographs are woven together with quotes from Irish historical sources, like the 1867 Prison Inspectors Report, Correspondence to the General Prison Boards Chairman, 1885, the Prisoners Rights Organisation Report 1978, and The Jail Journal (1973-76). The fact that the posters and ads are located near the jail is important – particularly as for McCann it disrupts what you might think of as ‘traditional advertising’. Keeping people out is a really easy way to demonise people… We are trying to humanise the prison experience and are looking at healthcare as a way to do that. He said that the quotes suggest “little everyday indignities that you get in prison”. So things like when prisoners are in reception, when they arrive in prison first there’s a quote from the 70s about having to strip down in front of prison guards and other prisoners. And then another one is about from about 1975 is about being locked in your prison cell for 15-16 hours a day with no sanitation, but a chamber pot. It’s those little dehumanising things that we wanted to draw attention to. He said that while those experiences were of their time, they want to use them to get people to question what sort of indignities might be happening within the prison system today. The Irish prison population reached 4,000 prisoners towards the end of the 19th century – but this began to decline. Going towards Irish independence, it declined rapidly and then peaked again during the War of Independence. Then it fell, and by 1955 it was down to 350 prisoners in Ireland. This was matched however with a lack of investment, leading to overcrowded and often unsanitary conditions in the 1980s. There was also regular rioting through the 70s or 80s, while practically no education was offered in prisons. Reform began in the 1990s, leading us to the situation we’re in today. “The quotes are quite emotive and the tone of the posters themselves are supposed to be reflective,” said McCann of the ads. “The sites of the advertising spaces is interesting because it’s almost like I used that as a device to draw people in. People will look at the poster and think ‘what is this trying to sell me?’ and then they realise it’s not trying to sell them anything. Through that process of trying to figure it out they are engaging with the material. We are bringing them into that space to reflect on that experience and what that might be like to have a mental breakdown in prison and to offer a space for empathy for people to come into it if they feel that is relevant. While Mountjoy Prison didn’t collaborate on the project, it knew it was taking place. More about the Health Inside project can be read on its website. Email “'He fought to maintain his sanity': Posters go up near Mountjoy raising awareness of prisoner healthcare ”. Feedback on “'He fought to maintain his sanity': Posters go up near Mountjoy raising awareness of prisoner healthcare ”.